Both major Backer Surveys have been sent. "RELENTLESS REX SURVEY 2: Weapons, Side Quests, & Environments" was emailed out August 15th and "RELENTLESS REX SURVEY 3: Friends, Enemies, Mutations, & Playable Characters" was sent September 16th. (If you've been having any issues receiving these emails, please let me know.) So if you contributed $15 or more during the Kickstarter campaign (or through the Rex Web Shop), don't forget to submit your original game ideas, which will in turn be added to a poll where backers will vote for their favorites to add to the game! Submissions Surveys will be closing soon so we can begin backer-idea voting, so make sure to complete them ASAP—Don't want you to miss out. It has taken some time, but thanks to your support, I've been able to bring in a couple of artists to speed up development and help finish the game. To keep things visually fresh and exciting, these artists will be illustrating and animating in their own unique styles (one of which is an awesomely-detailed pixel art). Fleshing out the remaining levels is the main focus right now, so we're hard at work on that, and will continue to show off rad screenshots and gameplay videos as significant chunks of the game are completed. For those receiving original Rex Artwork Rewards, I've setup a gallery from which you can select your piece. If two sheets are shown in a gallery photo, they come as a set and you get both. Each of these is lovingly claw-drawn and signed by yours truly on 8.5" x 11" paper, and in many instances, is the actual artwork used in the game. Because these were illustrated with game development in mind, some sheets may only contain "pieces" of a drawing, not a complete character or scene. For example, the intro screen for Relentless Rex: The Game depicts a baby dinosaur in my jaws, but that scene was composited from several separate illustrations (upper jaw, lower jaw, inside mouth, and baby dinosaur pieces). For anyone who backed the "Final Inked Art Reward," I'm also giving the option to receive a "cleaner," newly-illustrated scene (composed of any art pieces from the gallery that are meant to go together). Availability of artwork is on a first come, first serve basis, so make your selection sooner than later. 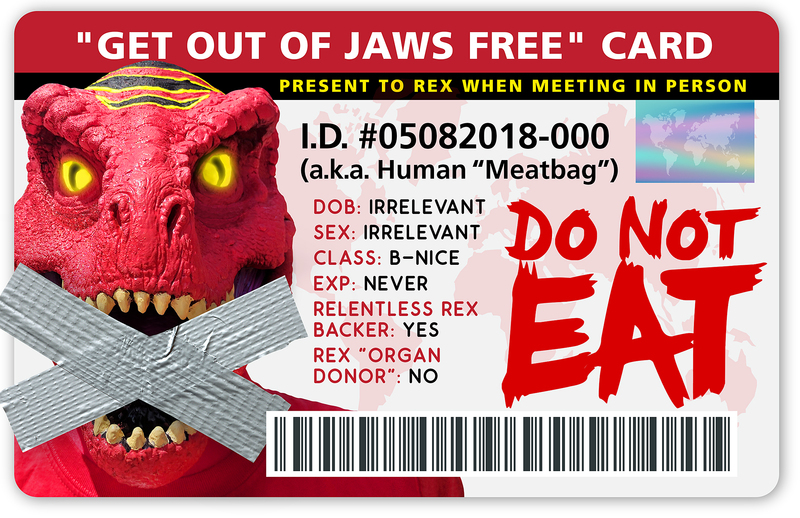 Lastly, here’s your Digital "DO NOT EAT" Card. Sorry for the delay with these, but I've been on a human-consumption bender for the past month and lost track of time (hope you're one of the few that made it out unscathed). My suggestion is to keep this on your phone or person at all times.😈 A high-res version of the card can also be found here. longie.long, Jenny Brook, and 1 more person like this update. Can we get a PDF version of the Digital "DO NOT EAT" Card so we can download it? Can I nominate myself as organ donor pls?